XL Video supplied an immersive projection system, d3 media servers/control and Barco ILite 12 LED screen for Massive Attack v Adam Curtis, a compelling and highly acclaimed installation performance which world premièred at the Mayfield Depot in Manchester as part of the 2013 Manchester International Festival (MIF). Up to 2000 people a night took in the performances. The charismatic Mayfield Depot – once a bustling train station opened in 1910, then a post-office sorting centre before becoming disused and derelict since 1986 – was a perfect setting for the first reveal of this enigmatic partnership. The visceral, edgy work relied on a careful fusion of the three main technical disciplines – video, lighting and sound. Filmmaker and activist Curtis’s incisive visuals accompanied by Massive Attack’s powerful, dynamic live soundtrack unleashed endless questions relating to reality and the imagination, managed democracies, the potency of wealth, data, knowledge and technology, totalitarian ideals and the randomness and frailty of life, all beautifully threaded through with the strands of real human stories and experiences. 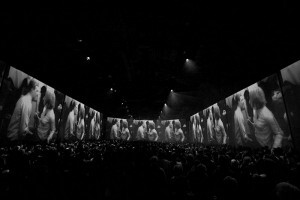 The video system was designed and coordinated for XL by project manager Gareth Jeanne and on site by Icarus Wilson-Wright, who has worked with Massive Attack since 2003. 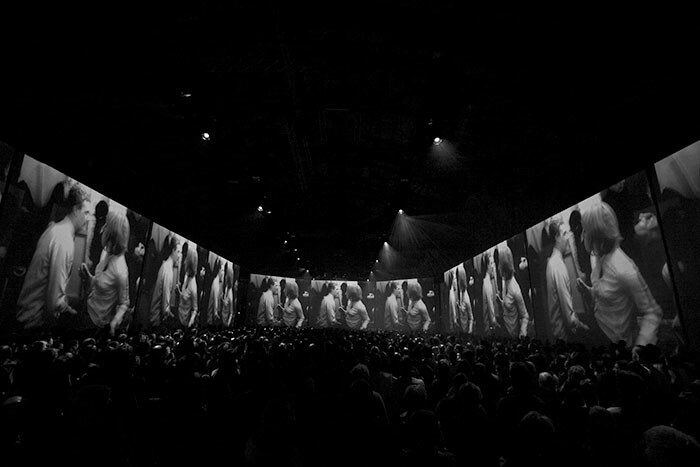 United Visual Artists (UVA) – who helped create the initial concept with Curtis and Massive Attack’s Robert “3D” Del Naja – have also been involved with the band for the same time period, supporting their pioneering use of video and visuals. The production – managed by David Lawrence – got in at the Mayfield Depot two weeks ahead of the first show and from there the installation really evolved properly as a fully collaborative process between both artists and all the technical departments. In Manchester, UK Rigging installed mini-beam trusses around the performance space to provide lighting and projector positions using custom beam clamps attached to the building’s steelwork superstructure. The part of the Depot used for the performance is below where the four original banked train platforms were run into the station, so the steelwork is extensive and extremely strong. 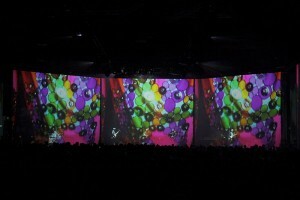 The 11 x 9.16 metre wide 4:3 format gauze screens were stretched on ground supported frames from floor to ceiling, four running down each side of the performance area and three at the end, behind which the band played onstage. The full size set up without obstructions (pillars) for Duisburg and New York consisted of eleven 10 x 9 metre gauze screens in the same 4:3 format. Beforehand, considerable research was undertaken by the XL team to establish the best material for picture quality and invisibleness. The screens were fed by 12 x Barco HDF-W26 projectors (including one doubled up pair at the stage end) rigged onto the roof trussing, all fitted with super wide angle 65-1 fixed lenses – so the line-up had to be extremely accurate. The Barcos were chosen for their brightness and reliability and the required keystone and perspective correction was all completed in the projectors’ internal settings. Two of XL’s d3 media servers using the latest hardware were used to deliver the content. Each projector was individually fed by fibre via a Lightwave Dual Link 8x8 DVI matrix using three Datapath X4 devices splitting the 2048 x 1536 image into four 1024 x 768 segments which were output to each projector. It was triggered by SMPTE timecode generated by the band. XL also supplied 96 tiles of Barco I-12 LED screen which was configured as a 16 tile wide and 12 high 4:3 format screen to mirror the projection screens. It was rigged on a scaffolding platform upstage of the band behind the gauze. This was also fed by selected content from the d3 servers and mimicked the almost apparitional appearance of the band behind the screens from time to time, revealed by some clever and precise lighting and also some grainy surveillance camera images. The projection set up was partially tested before the MIF run at LS Live in Wakefield – allowing Curtis and 3D to get an idea of the space before moving on site when the full collective development of the show really began. “It was an extremely organic process and very exciting to be involved in something so ground-breaking,” states Wilson-Wright, adding: “It’s a very personal statement from both Adam and 3D, so we all felt a real responsibility in delivering what they envisioned”. He worked alongside XL technician Richie Jewell and adds that the challenges of the site-specific environment in Manchester only increased everyone’s sense of mutual achievement with the end result a genuinely provocative experience that opens minds, asks questions about the power of imagination and reminds us that we don’t have to accept ‘information’ for the illusion it might appear to create! Lighting was designed by Tim Oliver and supplied in Manchester and Duisburg by HSL, the sound was mixed by Shan Hira and supplied by Wigwam/SSE for the two European shows.